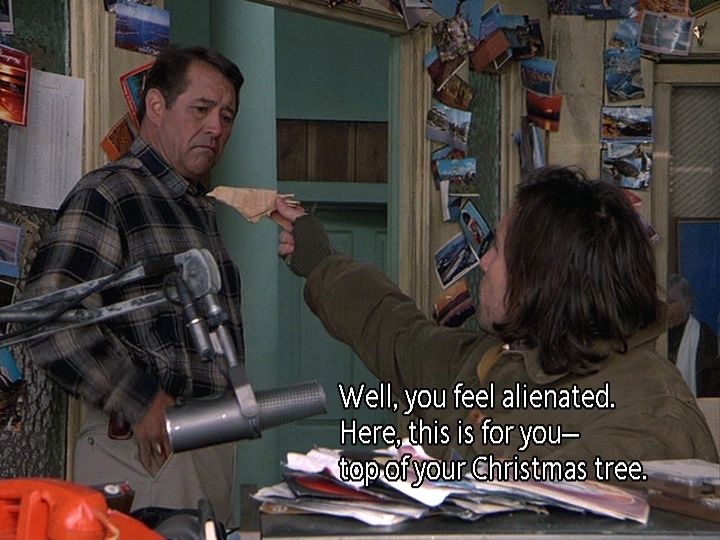 Log Line: Maurice, dreading being alone for the holidays, gets a big surprise when his gift is an instant family of his own. Meanwhile Maggie, dreading being with her family, gets a big surprise when her parents opt for a Caribbean Christmas without her. Even though we are three seasons deep into Northern Exposure, this is the very first time we get to experience Christmas in Cicely. But 3.10 “Seoul Mates” is not your typical holiday episode; right from its opening scene, we experience a kind of Christmas we’ve never seen before. Replacing the typical snowmen, reindeer, and Santa decorations are ravens, and lots of them, perched on every railing, hung from every wall, strung from every tree. And not only that, many of the ravens are of the kind from the traditions of Northwest Coast First Nations. There are Christmas lights, decorated trees, and even egg-nog, but the combinations of the ravens, First Nations culture, and traditional motifs signal to the viewer that this will be a very different Christmas indeed. The town is covered with snow, the coloured lights are blinking, and throughout Cicely there is an overwhelming feeling of goodwill. It is hardly surprising that the episode is filled with instances of giving, since it is infused with two dominant narratives: that of Jesus and the nativity, and that of the Raven stealing the light. Both stories feature giving: the Magi bring the baby Jesus gifts of gold, frankincense and myrrh, while the raven gives light to the dark world. 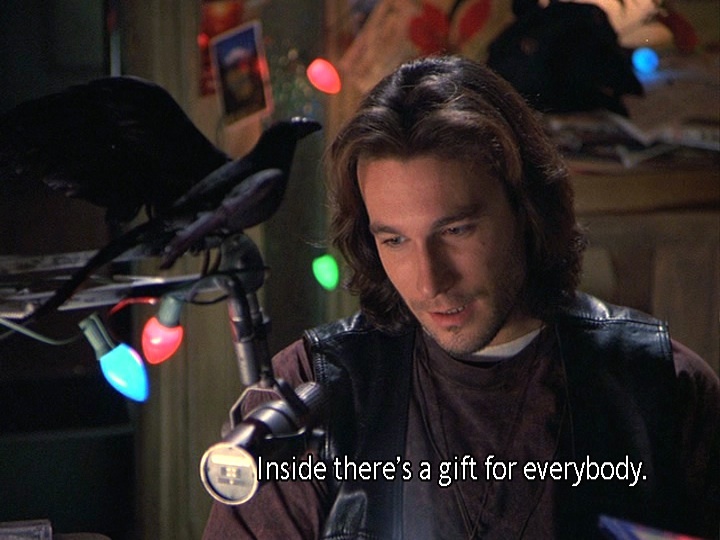 In an early scene, Chris gives a raven he has carved to Maurice, who in turn gives it to Shelly. Shelly tells herself the story of the nativity, with a Wise King giving his gift to baby Jesus. 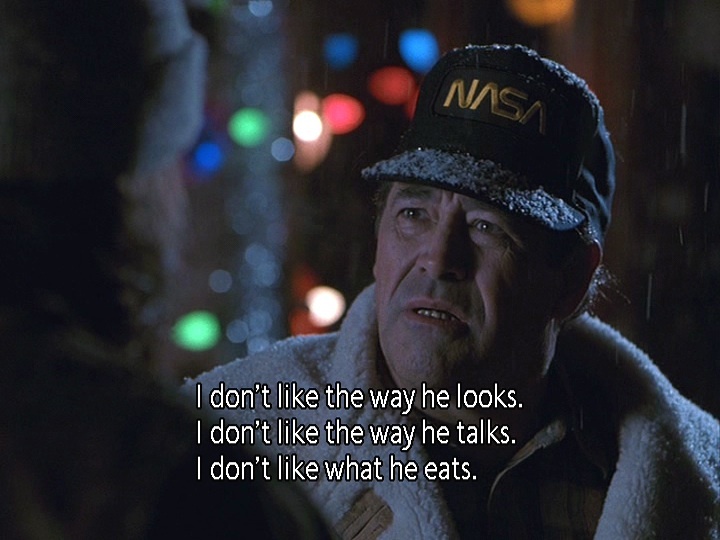 Ed offers to cut Joel a Christmas tree. 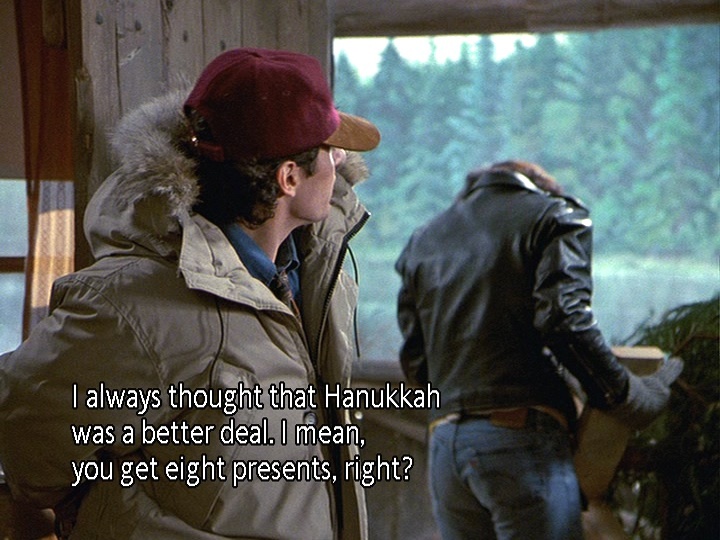 Joel compares Hanukkah with Christmas gifts, and recalls as a boy envying an autographed baseball glove that his neighbour received. Duk Won gives Maurice the gift of a song. 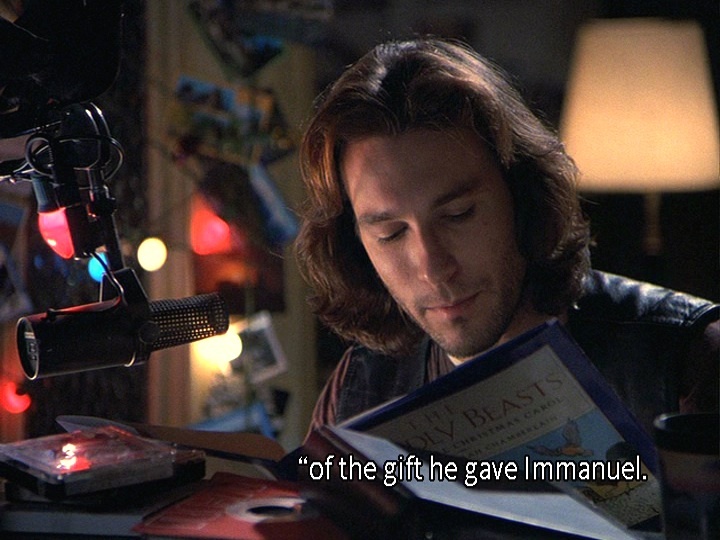 Chris reads a children’s book about animals giving gifts to baby Jesus. And compares different peoples’ experiences of Christmas to the contents of Santa’s bag. 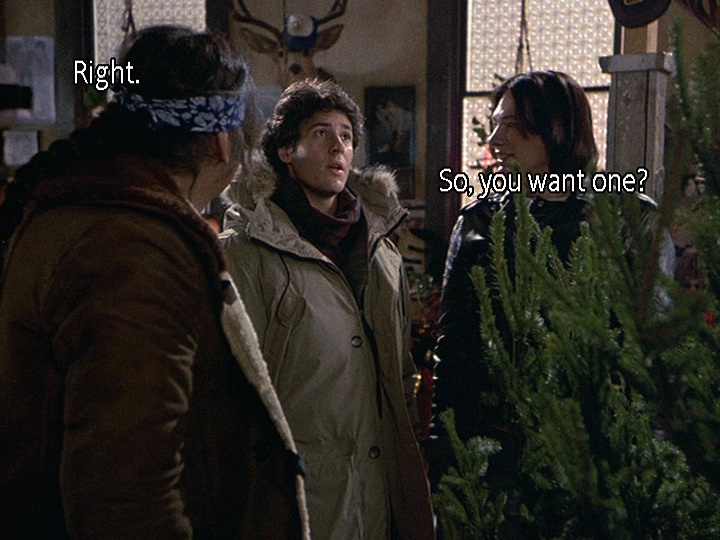 Joel gives Maggie a decorated Christmas tree. 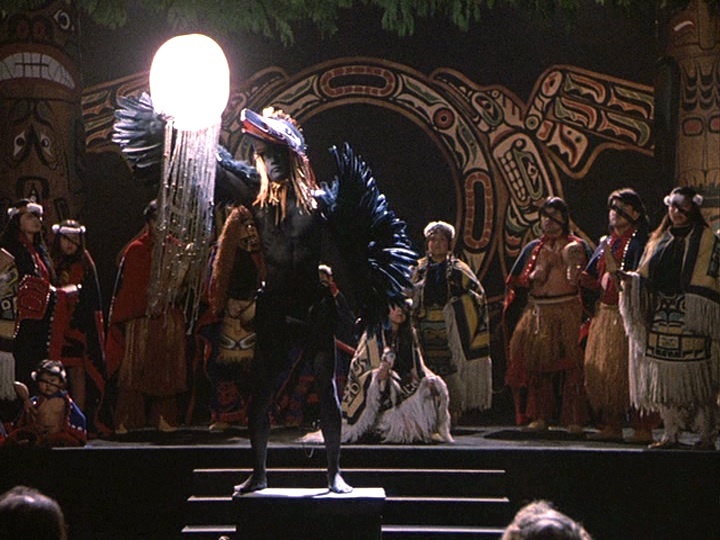 In the story of how the Raven stole the light, the Chief gives the boy/raven the ball of light, who then gives it to everybody. A part of giving is the receiving, but there is also the bigger idea the ‘Christmas miracle,” the idea of waking up to a full stocking, and perhaps waking up to a wish fulfilled. Interestingly, a number of characters got what they wished for, but the results are often mixed. 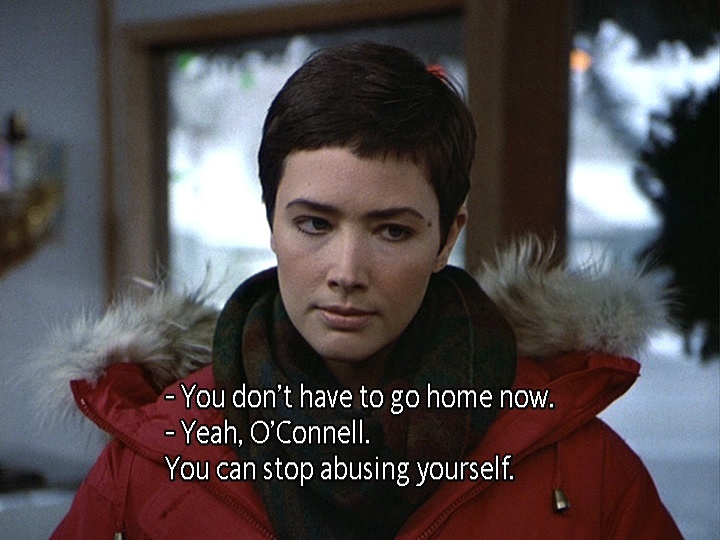 Maggie gets her wish of not going home for Christmas, but falls into a melancholy when she gets the news that her parents are vacationing without her. She is definitely not happy to get what she wants. Maurice, after complaining about being lonely and without a family, is disappointed at finding out his son is Korean. 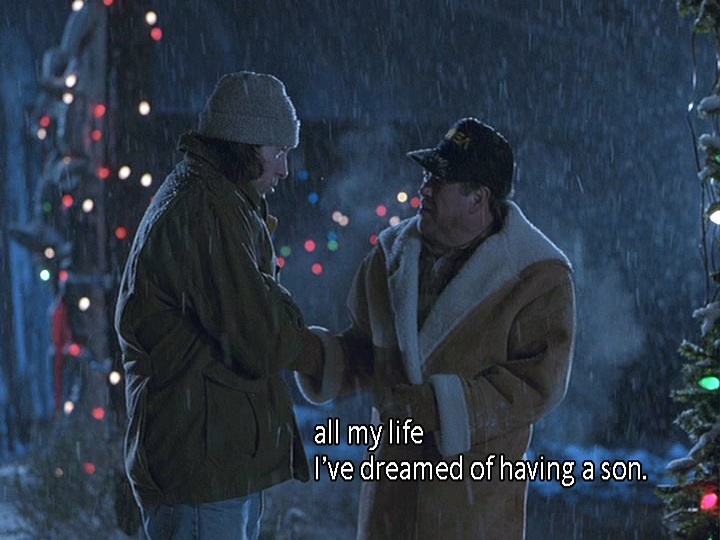 In a happy and touching moment, Holling gives Shelly the traditional Christmas she had wished for. Chris tells of the time he got his Christmas wish when he heard his dog Buddy talk, and wishes the same for his listeners. “Seoul Mates” is exceptional. 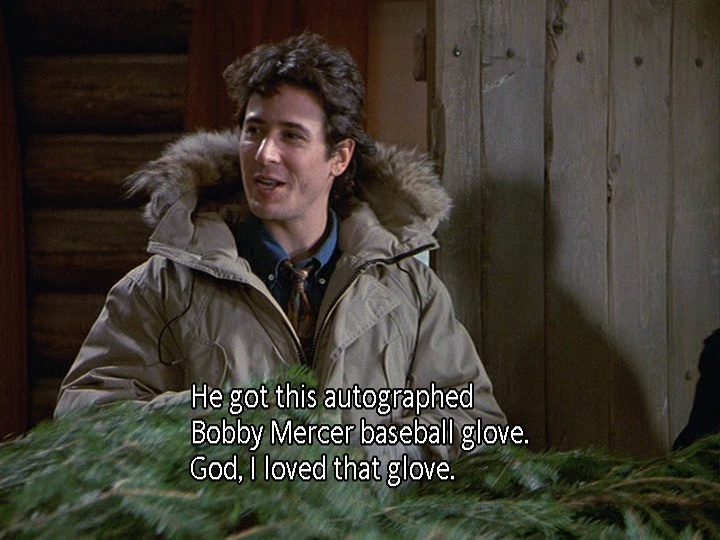 It’s more than anyone can ask for in a Christmas episode. It explores the meaning of family, combines many religions and cultures, and even explores ideas of loneliness and prejudice. It shows the best in the residents of Cicely: their generosity, humour, and willingness to change. 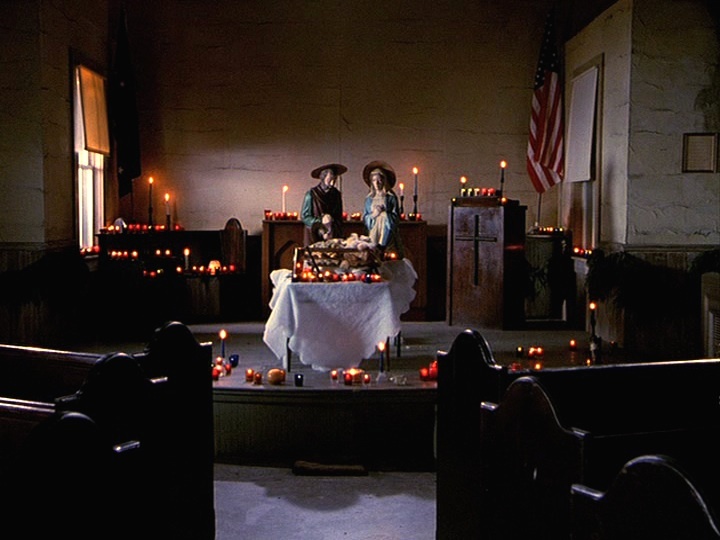 Best of all, the episode is genuinely moving, as in the scene with Shelly and Holling in the church. No words are spoken, but glances and the singing tell all. Ultimately, the episode is like the ball of light emerging from a darkness: illuminating our own little corners of darkness and giving us hope for a bright world. Themes / Recurrences: Giving; wishes; family, the past; tradition. The Good: There is a lot to love about this episode, including the final scene of the Raven Pageant. Holling singing to Shelly is another wonderful, emotional moment. Nearly every one of Chris’ speeches, including his story about Buddy the Dog, are great, as well. 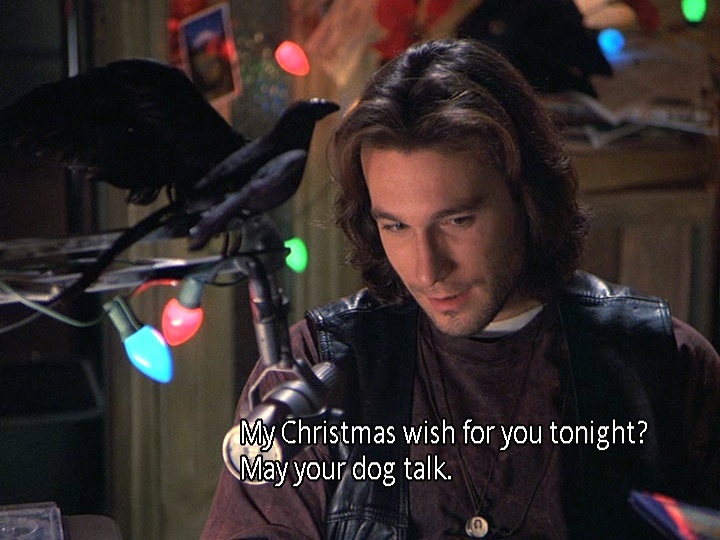 And we can’t forget all those ravens. Like we said, it’s chockablock with goodness. 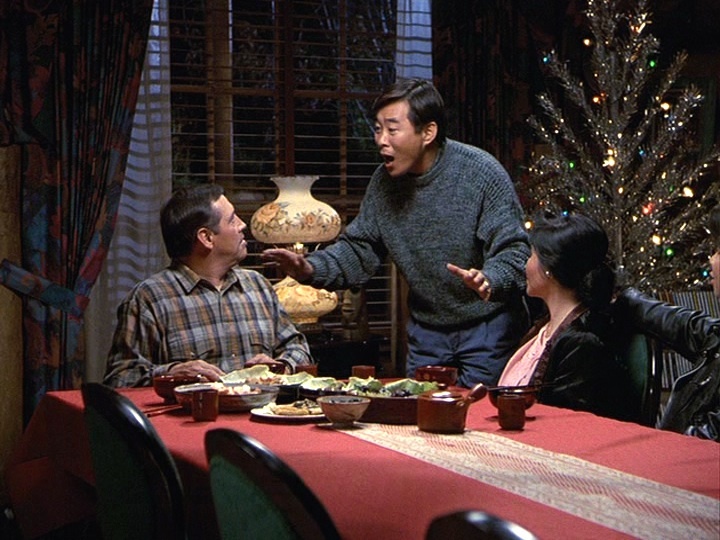 The Bad: The portrayal of the Korean family isn’t as nuanced as it could have been. 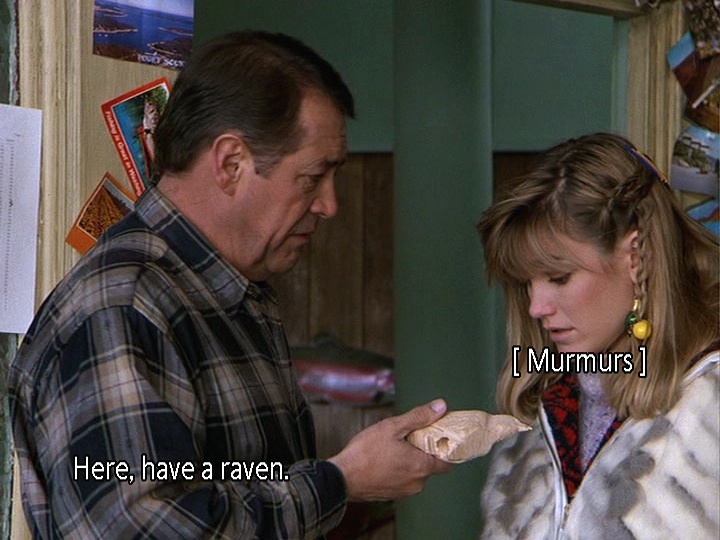 It would have been nice to see these characters given more depth, like many of the First Nations characters on Northern Exposure. The Notable: We get to hear John Cullum sing for the first time on the show. Talk about notable (pun intended). The Linkable: A great article from the AV Club by Phil Dyess-Nugent about “Seoul Mates” from 2011. A great read! On’s Rating: 9.5 out of 10. Shane’s Rating: 10 out of 10. I found parts of this episode hard to watch, but the payoff at the end was great.